Transitioning apps that were once fully private to being more 'open' and shared is a challenge but gives an opportunity to explore more human and empathic ways to introduce new features. Mapstr is a real startup with the world's first map-meets-notes app. It lets people save their favourite places and share them with friends. It also provides custom tagging that allows people to group places in meaningful ways. Privacy is key, so people can choose which places they want to share and with whom. In general, people may have reservations about readily sharing their location with others. However, not sharing their location may cut them off from important features, and negatively impact their experience of an app. For mapping services that rely on this information, it's especially important that they inspire trust in people and ensure that a person's location isn't shared without their understanding or consent. This is where design is key to shine a light on how a person's data is used and provide meaningful options on how much to share. This can go a long way to dispel fears and build trust in a service. ...make asking for data feel honest? Mapstr is open about the purpose of asking people to share their contacts and what they'll get out of it. Using straightforward language and light humour helps to dispel fears that people's contacts might be spammed and also lets them know that the team behind the service are people too. When asking for access to a person's contact list, Mapstr gives people the choice to control access: 'Do this once,' 'Do this continuously to detect new friends,' or 'I don't want to do this.' 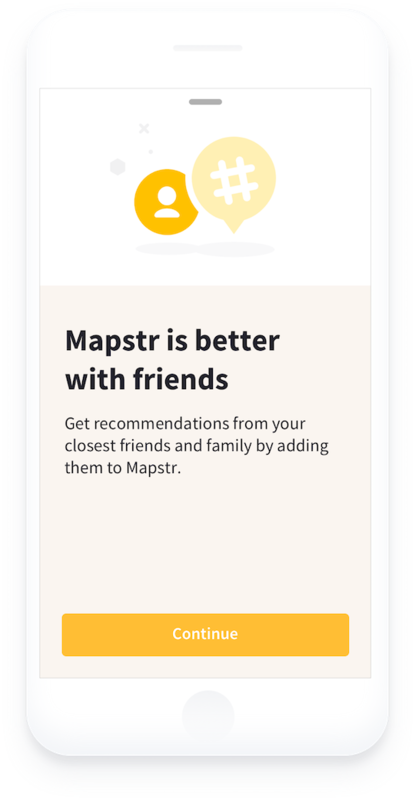 Each choice is given equal weight and Mapstr presumes the most private setting by default over continuously detecting new friends. Instead of constraining a person's choice to a binary 'yes' or 'no', they are given choices that allow them to negotiate their engagement with the app. It allows for trust to be built through interactions over time that put people in charge. Mapstr plans to use their Design Jam work as they continue to develop their app. Explore how we might pique human interest while not veering into the realms of 'clickbait' or 'dark patterns'? Make data exchange feel more conversational and human? Give people greater, more granular control over the personal data they consent to sharing?